Today I bring you yet another story from Shannon Hahn at Double L Stable Equine Rescue in New York. For the last six years, I have featured different horses from Double L, and in the process, also plugged that organization's Valentine's Day fundraiser. Please see the bottom of this story for information on how you can support Double L and also be entered in a fun contest. I'm also hosting another giveaway of my own in the form of a free 2014 Blood-Horse calendar. Be sure to leave a comment on this blog with your favorite racing moment of 2013 for a chance to win! What do you get for a $550 adoption fee at Double L Stable Equine Rescue and Sanctuary in upstate New York? You might get lucky and find a horse like the winning mare Theres Trouble as Jackie Salach did in nearly a decade ago. The recent freezing conditions that have overtaken most of the country reminded Shannon Hahn, co-founder of Double L, of the story of Theres Trouble, the first Thoroughbred that came to the rescue directly off the racetrack. "It was late in the year and the ground was frozen hard and covered with snow," said Hahn. "Early in the evening the phone rang and it was a contact asking if the rescue had room for a racehorse." Hahn obliged, and the well-traveled mare arrived the next day at the Argyle, N.Y. farm, after a four-hour trailer ride from Finger Lakes Racetrack. During her race career, Theres Trouble campaigned at Aqueduct Racetrack, Belmont Park, Tampa Bay Downs, in addition to Finger Lakes. The hard-knocking mare compiled a record of 3-8-11 from 64 starts, for earnings of $81,461. 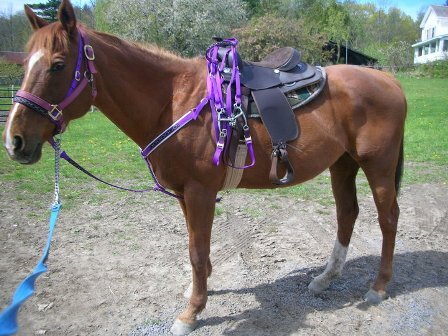 Now 16, Theres Trouble is by Islefaxyou, out of the Noble Nashua mare Top of the Charts. "The lovely chestnut was polite and kind and very agreeable (when she arrived at Double L)," remembered Hahn. "She boasted a shiny, red coat and beautiful snow-white stocking and blaze. Her ears were alert as she took in her new surroundings and assessed the horses around her." Theres Trouble was given the nickname "Chrissy" in light of the impending Christmas holiday. "Her personality was illuminating like holiday lights and her movement reminded everyone of tinsel floating off the branches of the tree," said Hahn. It did not take long for Chrissy to get adopted by a woman named Kelly Davis. 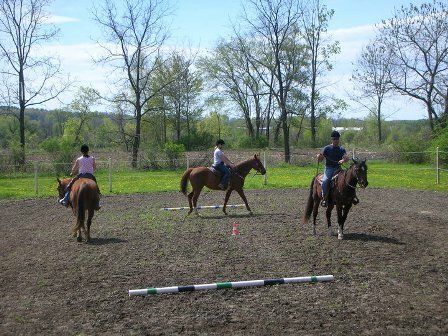 Chrissy spent a month with a local trainer to learn how to become a pleasure horse for Davis, but the match was not meant to be, and so she was put back up for adoption. 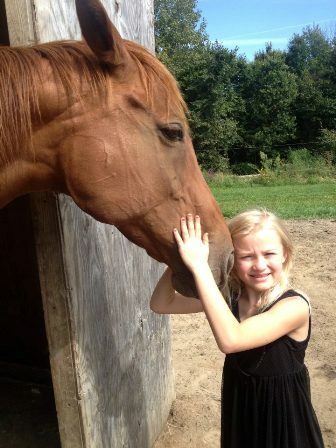 Even though that particular adoption didn't work out, Chrissy helped forge a connection between Double L and Davis that caused her to adopt three other horses that went on to live productive lives. 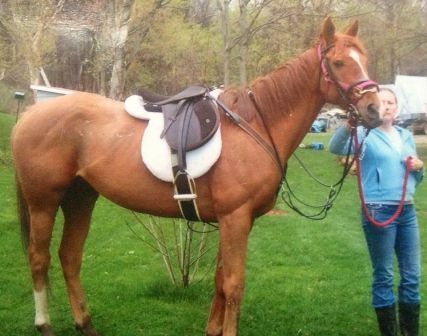 Chrissy finally found her own forever home in 2005 with Salach, who decided the mare was exactly the type of horse she had been searching for. Hahn reported that Chrissy had been wonderful addition to Salach's family, and over the past decade, she has learned both English and Western styles of riding. "She has carried riders in all types of situations and is currently learning to do a drill routine with three other horses," said Hahn, who receives regular updates on the mare from Salach. Hahn added that Chrissy's health had been superb throughout all of her adventures and has required very few visits from the vet outside of yearly check up and shots. "She is not a stressful horse and lets everything just roll along agreeably," said Hahn. "She gets along fine with other horses and doesn't make trouble." 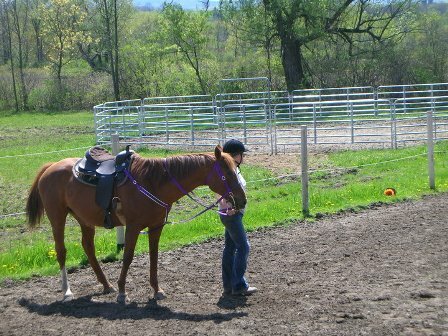 Salach's 7-year-old granddaughter, Ayla, is currently learning to ride Chrissy. "Chrissy is such a good tempered horse, and at the age of 16, she is ready to start her next chapter of fun and will be learning a trail course riding this year," said Hahn. "Is there anything this girl can't do? "Chrissy has proved herself dozens of times over and shown how the love and dedication a willing, smart off-track Thoroughbred can freely give is priceless. Jackie is looking forward to many more years of riding and love with her dear friend, and Double L is proud to say they helped turn this ex-racer into a cherished family member." Hahn shared how Double L Stable Equine Rescue and Sanctuary has received many calls over the past few years from people who have become victims of the hard economy and are no longer able to care for their horses. "Double L will continue to help in any way they can, and with each horse placed in safety, smile just for a moment," she said. "Theres Trouble may have been the very first ex-racer placed by Double L, but she will not be the last." Double L Annual Valentine's Day Fundraiser: Here's how you can help! This winter's harsh weather has caused Double L to go through supplies quicker than usual. If you want to show your support for Double L, then send them a Valentine! From all the Valentines sent to Double L's horses with a $1 bill tucked inside, one lucky winner will be drawn to win a $25 Visa gift card. Cards must be postmarked by Feb. 28 to be eligible for the contest. The cards will be hung in the barn for all the visitors and volunteers to see. Double L is only asking for a $1 but feel free to send anything you like! Be sure to include your return address on the card's envelope. The rescue will keep updates on the cards coming in on its new Facebook page. Over the years, Double L has received Valentines from all 50 states, as well as England France, and Canada. This year, if the rescue raises $5,000 and gets 500 likes on Facebook, the gift card amount will be raised to $50 for a grand prize, and a $25 second place winner will be also be drawn. Double L also continues to work with at-risk youth and high functioning handicapped folks, as well as people doing community service through the local county drug court. Your support is very much appreciated! In the spirit of giving, I (Esther) thought it was definitely time for another giveaway. Who wants their own 2014 Blood-Horse calendar? 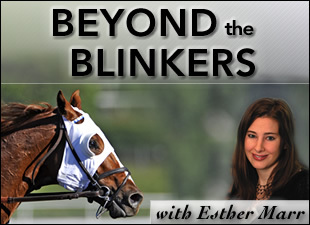 To be eligible, please leave a comment below noting your favorite Thoroughbred racing-related moment of 2013. A winner will be drawn on Friday and notified directly by email. Thanks for playing!